Teachers are generally a pretty conventional lot. We try to do the right thing, firstly by our students; by their parents; by our colleagues; by the system… Lots of expectations coming from lots of directions and we try to accommodate them all. The right thing by our students is of course number one. That stands as a universal core belief. Teachers strive to meet the needs of their students, using whatever talents, current programs and approaches they have at their disposal. As another example, the right thing by colleagues is also important and involves being a team player; sharing ideas and resources; shouldering responsibilities; being aware when colleagues need support. There would be little debate that these are right things to do. But what if the right thing is the wrong thing? Past experience presents examples of well-intentioned but ill-fated methods, for example: grading readers so that only the most proficient are entitled to the most engaging literature; subjecting students to context-void grammar exercises; putting a ceiling on learning so that students only progress when the whole cohort has served its time; foregoing explicit teaching in favour of an osmotic approach; streaming students according to their perceived ability; pigeon-holing learners into particular receptive learning styles; reducing performance (of students and teachers) to a number. In the past decade or so the right thing has become a ‘relentless focus’ on literacy and numeracy, while filling up the rest of the curriculum with as many disciplines as can possibly be crammed into a school day. In senior secondary school the right thing is getting through the examinable curriculum in a timely fashion, rendering students test-ready. Students come to interpret the right thing their own way, with ‘Is this task assessable?’ (And by implication, ‘Otherwise it’s not important’). The great challenge for teachers though is knowing what the right thing is, if indeed such a thing exists. When a policy or training or expectation sets a right agenda, it takes a brave and well-informed teacher to question that agenda. 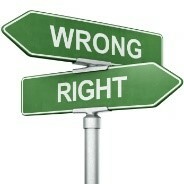 So how to find a way forward and be able to recognise the wrong thing for what it is? (understanding of course the complication that the wrong thing in one context may right in another.) An important part of the answer to this dilemma is evidence, i.e., having the means to verify in particular circumstances that an approach is truly effective. Because although entirely familiar with the notion of evidence in terms of student progress, teachers are not always as confident assessing the quality of recommended (or prescribed) approaches, even when their professional judgement may be ringing alarm bells. Increasingly, however, we have an appreciation of the power of evidence and evidence-based decisions and, moreover, the tools by which that evidence is made visible and accessible. The principles of improvement science are applied to teaching and to leading; action research is commonly applied by teachers and leaders to their practice; rapid feedback mechanisms are facilitated by technology platforms; students use design principles in taking control of their own learning; networked communities share practice. Teachers don’t have to accept the prevailing doctrine – we can test its efficacy for ourselves and in doing so, give voice once more to informed professional judgement. It will be interesting to see how teachers and systems navigate the proposed changes to the HSC and the use of Year 9 NAPLAN results to establish those students not meeting minimum literacy and numeracy standards. What will be the ‘right’ thing?